I saw the link Old Photos of Liverpool put up to your piece on the Liverpool Blitz and the books you have wrote on the subject. I was wondering if you could help me? I live in Birchtree Road in Aigburth, post code is L17 0DS. I was talking to one of my neighbours some time ago and she told that our street was bombed during the war. 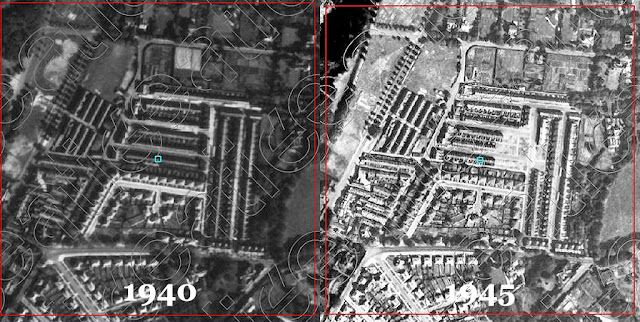 It would seem that there was some truth in it, as in a portion of my street and 2 other neighbouring streets, Holywood Road and Fernwood Road, the old terraced houses stop and newer houses have been built. I have become very interested in finding what happened and when but the only information I have been able to find is from a website that sells aerial photographs, that seems to confirm that it was bombed. There is a photo from 1940 that shows the terraced houses all intact, then a photo from 1945 that shows a section of the houses missing. Other than that, I have not been able to find out any details. 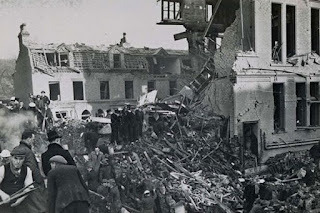 Given your knowledge and research into the blitz, I was wondering if you had any information, dates, photos etc of this event? Or if not, where would be a good place to try and get this information." As you'll see Pete has already done some sterling research himself, and introduced me to a site I'd not seen before, but intend to make extensive use of in the future. Using the Commonwealth War Graves Commission website I was able to piece together more of the story for him. At 51 Birchtree Road: Jessie Dow (63) William Dow (26) and Jessie Dow (20) - the latter two were the children of the former. The father (another William) must have died before the war as he's mentioned as "the late". William junior was a fireman with the AFS. At 53 Birchtree Road: Barbara Ellen Williams (48) and Price Goodman Williams (48) a husband and wife. At 25 Fernwood Road: Edith Seafield (37), Francis Brian Seafield (11), John Alexander Seafield (13), Thomas Albert Seafield (14) Thomas Alexander Seafield (39). Edith and Thomas Alexander were husband and wife, the others were their children. At 29 Fernwood Road: Mille Miller (35), Frederick William Miller (35) Robertina Miller (56), Rebecca Miller (83), William Henry Miller (56). Robertina and William were husband and wife, as was Mille and Frederick. Its not known what relation Rebecca was, but presumably she was an extended family member. At 31 Fernwood Road: Mary Ellen Hesketh (58) she's listed as having a husband who wasn't amongst the dead, but no other details are mentioned (he might have been injured, unharmed or away at the time). At 33 Fernwood Road: Edward Collins (38), Mary Collins (30) its not entirely clear but they may have been brother and sister since their listed as having the same parent's names. Mary Howard (6) is also listed as a casualty, but its unclear why she was present at this address, her parents (Charles and Margaret Howard) lived in 19 Ashlar Road, Aigburth which isn't far away, so perhaps they were relations or just looking after the child for someone. Neither parent died in the raids. 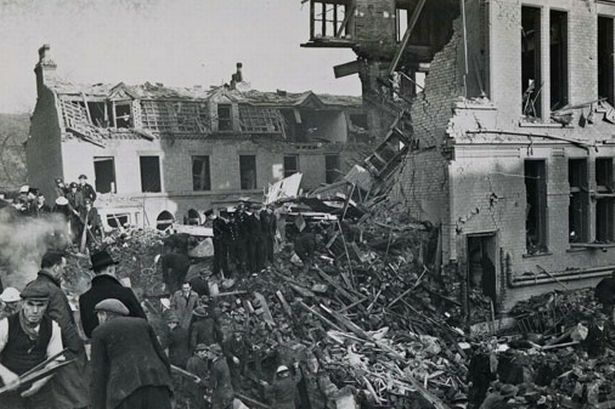 Given the fact that 8 people died in Birchtree road, and 18 in Fernwood Road, the proximity of the houses to eachother and the widespread damage in the aerial photgraphs, my thought would be that the damage was done by a parachute mine. 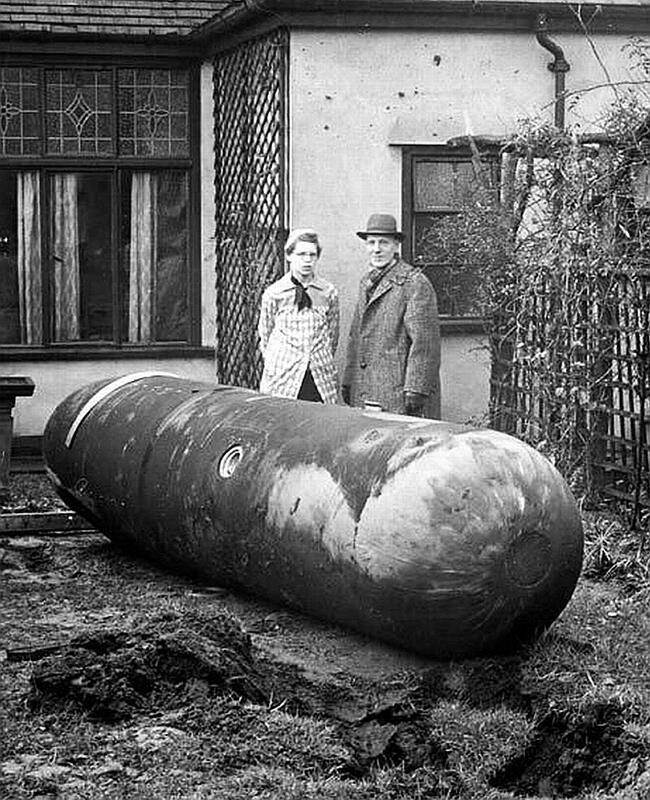 One ordinary high explosive of even the largest size the Germans had would never do such widespread damage, it would take several, and the casualties would have been correspondingly more widespread. Parachute mines on the other hand were quite capable of blasting apart half a street, and virtually every one of the major wartime incidents was caused by one. 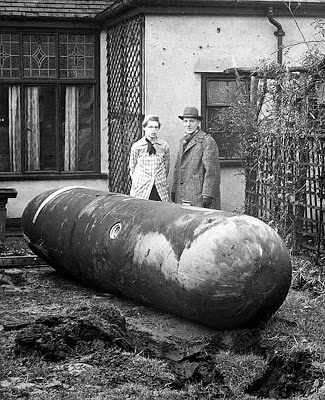 A photo of one that failed to explode can be seen [here]. It fell on the garden of a house in Score Lane, Childwall. A very famous incident occurred on the same night at the college on the corner of Durning Road and Clint Road. its for this reason that this incident is probably less well known, on any previous night the loss of at least 26 people in one small area would be a major incident, but on this night well over 150 people lost their lives at the college when the basement they were sheltering in was hit by a parachute mine, with the basement shelter collapsing onto them. "Fernwood Road, Elmswood Road, Ashlar Road area. Mossley Hill Road South near Holmefield Road. Several houses demolished, a number trapped under debris. Grounds of house in Woodlands Road (02:45)"
Although these files list this damage under "HE [High Explosive, typically meaning a bomb] on the following points" this is inconclusive since the Durning Road incident is also listed here. With Pete's permission I've reposted the information here to bring it to the attention of anyone else with an interest in the area or subject.